Zippedy organized a youth program for the International Day of Peace that included a new conflict resolution puppet show and children sharing their paper bag puppetry! See video: International Day of Peace, Sept. 21, 2018. Library puppet show with Zippedy the Clown presenting clown magic and “Florachica Joins the Circus.” Eureka, California, 2010. Parades at Plan It Green Expo, Arcata, California, 2009 – 2010. Performance artist and birthdays as Zippedy the Clown: Fourth of July parades, fairs, walkabouts, and birthday parties, California, Oregon and Montana, 2002-2006. Puppeteer and Playwrite for North Mountain Park Environmental Education program, Ashland, Oregon, 2005 - 2006. 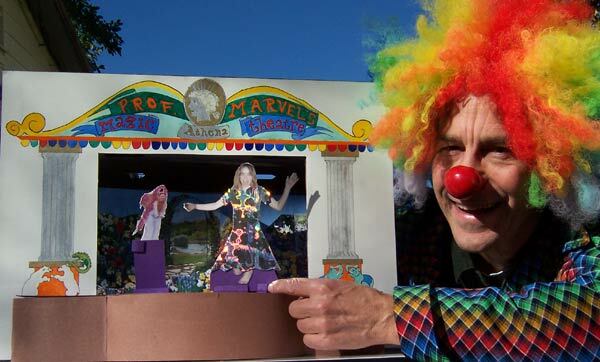 "Florichica Joins the Circus," puppet playwriting and performance, Laguna Beach, 2006. Gibberish Party and Performance, co-director and creator, Laguna Beach, 2006. "Professor Marvel's Magic Theater" at the invitational Great Small Theater Exhibition, New York City, 2005. "Whitney and the Fairy" puppet show on Professor Marvel's Magic Theater, Medford Center for Spiritual Living and Ashland Lithia Fountain, 2004 - 2005. Clown performances, including audience sing-alongs and joke-telling, Ashland Lithia Fountain and Grill, 2004. Youth Parade and Performance facilitator, incorporating artwork, clowning, performance art, ritual theater, puppetry, and parades. Good Medicine Gathering, NFCC Summer Camp, and Northwest Sufi Camp, California and Oregon, 2004. Ashland World Wellness Weekend Clown parade and walkabout, Summer 2004. Writer and performer in "The Cosmic Clown Show," as Zippedy-da-Guru Clown, a satirical play about New Age spirituality; Center for Spiritual Discovery, Medford, Oregon, 2003, Wilderness Dance Camp, Utah, and St. Mark's Church, Livingston, Montana, 2002. Public television lecturer and writer in "The History of Words and Pictures," featured at Southern Oregon University School of Art, and online at www.scctv.net/nscc/robert_gluckson.asx, Ashland, Oregon, 2002 - date. Television commentator and writer, the Northwest Teleweb Project (a combined TV and Internet online course); ten segments shown throughout Puget Sound, Washington, 1998 - 2004. Actor for "Political Playhouse" public television show: Television News Announcer, Corrupt Politician, Professor Stoner, College Professor, Seattle, Washington, 1994 - 1999. Hungarian Dance Performer, for malls and cruise ship, Seattle, Washington, 1996 - 1999. Rainbow Lights Multi-Media Light Show Producer, Mendocino and Humboldt Counties, California, 1974 - 1986; revived for exhibition at "What Happened to the Hippies" lectures and workshops in Ohio and Washington, 1989 - 1995. Harlequin Performance at the Grand Opening of the Rainbow Ballroom, West Hollywood, 1972. Southern Oregon University Extended Campus Programs: "Storyboarding" and "Art and Science of Harry Potter Magic" programs at regional Junior High Schools, Southern Oregon, 2005 - 2006. Mask-making and Parade Art Playshops for the Ashland North Mountain Park Earth Day All-Species Parade. Coordinator and Ringmaster, networking between artists, teachers, and community groups, Southern Oregon 2005. Art Workshops that inspire youths and adults to unleash their creative potential, linking academics with creative activities, and encouraging the study of natural history, consumer awareness, and critical thinking. Taught for art museums, park departments, and schools in Washington, Montana, and Oregon, including the Schneider Art Museum and the Rogue Valley Youth Correctional Facility. 1989 - present. Film and Journalism Instructor, Southern Oregon University, Rogue Community College, Vashon Alternative School, North Seattle Community College, Humboldt State University; Washington, Oregon, and California, 1994 - 2005. Puppetry Production Grant, $4000, Celebration Foundation 2006. Clown Education and Parade Performance Grant, $4000, Celebration Foundation 2004. King County Arts Commission Grants for Arts Criticism in Reflex Magazine, 1997-1998. Laughter Yoga Certification from Jeffrey Briar, Laguna Beach, California, 2005. Camp Winnarainbow, Wavy Gravy Clown Camp; with guidance in stage presence with Txi Whizz, character development with Moshe Cohen, mime with Bryan, and theater games with Wavy Gravy, Mendocino, California, Summer 2004. Mentoring by Alicia "Bubbles" Bonnet, in clowning and balloon twisting, for fairs, walkabouts, parades, and birthdays, 2003 - 2004. Jeffrey "Marvel Productions" Briar guidance in make-up, street performance, clown literature, and marketing, 2003 - 2005. Workshop with Pamela "Heartfool" the Clown: in mime, character development, and working with young children, 2003. RVTV Television Producer, ten week Production Class certification, 2002. Master's Degrees in Communications (University of Washington), 1992, and Popular Culture (Bowling Green State University, Ohio), 1989. Bachelor's degree in Mass Communications with a Public Relations emphasis, (Humboldt State University, California), 1985.